My awesome blog sponsor is at it again. This time they are offering TWO lucky readers the chance to win 250 7" x 5" Custom Greeting Cards (half-fold, 10 pt cover with matte or gloss coating, full color outside and blank inside). I plan on using my Custom Greeting Cards as thank you notes for the apartment community where I work. There are so many ways to use these cards that the possibilities are endless. 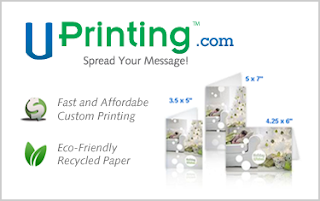 And remember UPrinting.com also does Custom Postcards if you want something easier to mail. For your chance to win simply tell me how you would use the Custom Greeting Cards if you are selected as a winner. Please be sure to leave me your email address if it's not in your blog profile. This giveaway is open to US residents only and winners must pay shipping. Winners will be selected on September 2nd and have 48 hours to respond to the winning email or a new winner will be selected. I would use mine ot put my 3 awesome grandkid on them..I do not get to see them hardly ever and love to get pictures of them and i would love for all my friends here in California to see them..they live in ohio..
pics of my new hometown, Boise, Idaho. In fact, I just bought a 2010 calendar tonite with some amazingly beautiful photography. I can always use greeting cards, and have many pictures I can use for them. I love blank cards as they can be used for any occasion. Hi!!! I would use mine as Christmas cards! My husband and I always do personalized cards for Christmas highlighting our activities over the past year! Thanks for hosting!!! I would use my cards as thank yous for all the great gifts that I will get this year. I am an artist and would love to have the cards to put my art on. This would be great to use in the classroom so that I can drop positive notes in the mailbox to be a surprise to the students and parents. I think it would really brighten the day of all those parents who are used to negative comments when they open good mail. Since I am in the process of starting my own business, I would use these cards as a marketing tool to send to prospective clients. I would get the kids to make Christmas cards for their mom, Nana and Mimi. I would you my cards to send to my son in the Marines. He is going to be deployed in a few months and they would be great to send him pictures from home. I wuold customize the cards with events happening at home. I so want to win but do not have the mental ability to handle a feed. I pray I am not hooking up to a feed. I have to laugh because the world so frustrates me. I need to win to send everyone a please forgive my ignorance now. Wonderful Prize and great site. I enrolled I think to email. Thank You Again, email me if I accidently hooked up to a feed and how to dismantle it. Humbly,Heaven Help Me? I would use these for Christmas cards ... I could put a picture of my family on the front. I've always wanted to do that but it's just so dang expensive!! Just let me win!! Mine would be simple: my intials one the front and blank inside. Then, they can be used for any occasion. Since I'm known for giving books as gifts, I would use the cards as bookmarks to give with the books. I would use them as thank you cards. I think I would use these for Holiday cards...living out west we have lots of mountains, wildlife, snow picture we have taken. Might as well put them to good use!Thanks for the giveaway. We always make a custom Christmas card with photos of our cats, but it's only sent to a few people, because it's time consuming to do. This way, we could send our original card to everyone on our list. I am an artist and would do a blank card with a photo of my oil paintings to send for holidays, birthdays, invitations, etc so that friends, neighbors and family would have a small frame able print from me! As an invitation to a summer bar-bq!!! Invitation to my parents Anniversary Party Next SEptember! I will most likely use them to promote my daughter's talent to her current and future agents. Thanks! These could be used for so many occasions. I would thank people for their expressions of Sympathy. Beautiful memorials have been dedicated to our deceased loved ones.